Spending will decrease, taxes rates will fall, and water and sewer rates will go up if Onondaga County Executive Joanie Mahoney’s budget goes through as is. She delivered her $1.24 billion spending plan Monday to lawmakers. 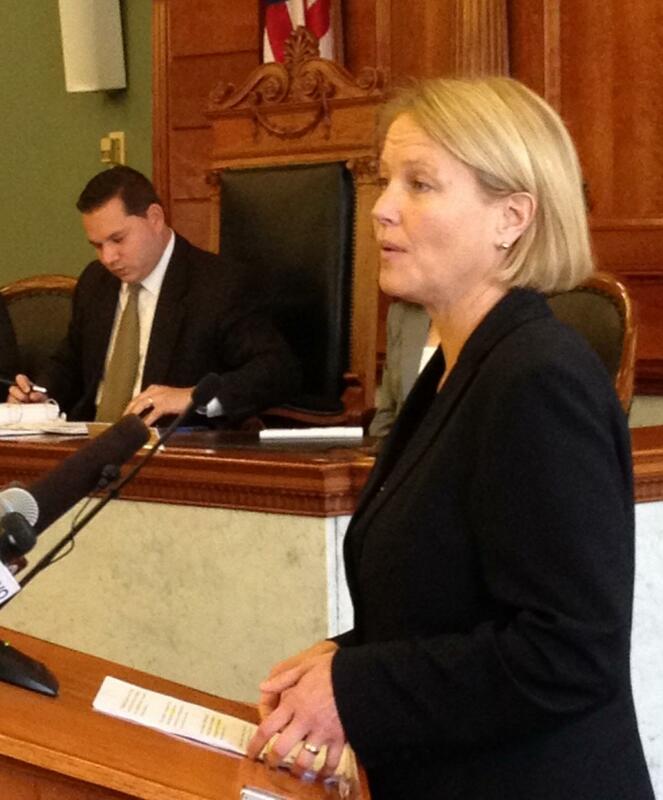 Onondaga County Executive Joanie Mahoney delivers her budget address. Legislature Chair Ryan McMahon is in the background. Mahoney says the property tax levy will drop by 1.2 percent, to a historic low. "With modest growth in assessed values, which is good news for homeowners, no increase in the levy means that once again the property tax rate will be reduced. We are continuing to drop the rate in a careful, methodical way." Mahoney says this is where sales tax revenue comes in. She says that, not property taxes, is key to keeping the county budget healthy enough to meet growing infrastructure needs. Joanie Mahoney explains the importance of sales tax revenue in the budget. Mahoney says her 2015 budget uses $4 million in fund balance..compared to the current year’s $7 million. She says water and sewer rates will go up as part of a 5 year plan to gradually increase user fees to continue the county’s obligation to maintaining its infrastructure. Mahoney says there are forces on both sides of the ledger: Lower pension costs, past due property tax collections, pilot payments, and sales tax revenue are driving revenues up. At the same time, Mahoney says a $3.5 million increase in wages and lower reimbursements due to fewer federal inmates the Jamesville prison are pressuring the ledger to the negative side. Separate from the budget, Mahoney asked lawmakers to approve nearly $50 million in bonding for the proposed amphitheater. WAER's Helena Battipaglia tells us how the county will pay off the bonds on the amphitheater. In addition to considering the amphitheater bonding, lawmakers will spend the next few weeks combing through Mahoney's spending plan. A vote is expected in mid-October. Ground was broken Friday on a facility in a rural area of DeWitt that’s expected to bring more of Hollywood to Onondaga County. In fact, the Central New York Hub for Emerging Nano Industries already has a tenant. During the state of the county address earlier this year, California-based film and TV company “The Film House” announced it will relocate its headquarters, production, post production, and distribution operations to the facility. President and CEO Ryan Johnson was on hand for the groundbreaking. "Not only will we get to work with this first kind of educational institution that will drive production and innovations globally, it will help train and develop our future workforce so we can continue to grow in Syracuse and build the film industry in Upstate New York." Lieutenant Governor Robert Duffy was among the officials turning over the first symbolic shovels of dirt. Lt. Gov. Robert Duffy says the CNY Nano Hub will be the first accredited nanotechnology film hub in New York State. It'll be one of 5 nano hubs across the state. Justin Steele is director of the upcoming film “The Opium War,” which will be filmed and produced in Central New York using the hub’s resources. But Onondaga County executive Joanie Mahoney says the hub goes beyond the film industry. County Executive Joanie Mahoney CNY should count itself lucky to be the next home for a nanotechnology hub. 15 million dollars in state money will build and equip the facility at the Collamer Business Park, but officials say that should leverage 150 million dollars in private investment over seven years. The project is expected to create 350 permanent, high-tech jobs and 150 construction jobs. WHAT'S NEXT FOR LT. GOV. DUFFY? People who visit or take their families to Onondaga County’s Rosamond Gifford Zoo can make a day of it. The might not have been the case when it first opened 100 years ago. It’s grown a bit, from what Joanie Mahoney calls modest beginnings.